BEIRUT (Reuters) - Four months of Russian air strikes in Syria are taking their toll on rebel forces, strengthening the hand of a defiant President Bashar al-Assad as the United Nations struggles to get peace talks off the ground. Insurgents in the west are being hit harder, while in eastern and central parts of the country, Islamic State is also under military pressure and is cutting fighters' pay as its oil-smuggling operations are hit by plunging prices. Rebel groups are reporting intensified air strikes and ground assaults in areas of western Syria that are of greatest importance to Assad. The government last week made one of its most significant gains since the start of the Russian intervention, capturing the town of Salma in Latakia province. While recent gains do not appear to mark a tipping point in the conflict, with rebels fighting back and regaining positions in some places, insurgents describe high levels of attrition on the front lines of western Syria. Officials close to Damascus say sealing the northwestern border with Turkey is the priority. A Syrian military source said rebel supply lines from Turkey, which backs the insurgents, were under pressure from Russian and Syrian air strikes. The course of battle underlines the uphill struggle facing U.N. envoy Staffan de Mistura as he seeks to launch peace talks. Even with U.S. and Russian endorsement, a new peace process seems detached from the realities of a five-year-old war that may not yet be ready for peacemaking. "Most opposition-held areas turned to defense because of the huge mobilization by Russians troops and the use of a large number of planes with unlimited munitions," said Jamil al-Saleh, commander of a rebel Free Syrian Army (FSA) group. While playing down the importance of government gains, Saleh said military aid from the rebels' foreign backers - including Saudi Arabia and Turkey - was not enough to confront offensives that are also backed on the ground by Iran. "These are among the difficulties facing the FSA on the ground especially since the aerial bombing is affecting some headquarters, equipment, cars and personnel and the aid given is little compared to the ferocious attack," he told Reuters. Saudi Arabia's support for the opposition has yet to be translated into the kind of heavier weapons the rebels are seeking, notably anti-aircraft missiles. The military source, speaking on condition of anonymity, said rebels were suffering from the destruction of their weapons depots, made possible by good intelligence. Their appeals for more support showed they had "lost a lot of field capacities", the source said. Noah Bonsey, senior analyst with the International Crisis Group, said levels of attrition remained high on both sides. "But it seems to be the rebel side that is more concerned about the trajectory at this moment, while the regime camp enjoys momentum," he said. "The regime itself never showed much openness for compromise even in its most vulnerable moments, so we can expect its current sense of momentum to further reinforce maximalism as Damascus pushes for a decisive military upper hand." Damascus and its allies are also doing better in their war with Islamic State, which is also being fought separately by a U.S.-led coalition from the sky and on the ground by Kurdish forces. The government has advanced to within a few kilometers (miles) of the IS-held town of al-Bab in Aleppo province. Slumping oil prices have added to the pressures facing the jihadists whose flow of foreign recruits has been choked by tighter controls at the Turkish-Syrian frontier, once a major transit route. Islamic State has also faced setbacks in Iraq, losing control of the city of Ramadi in recent weeks. Of the 3,000 people killed by Russian air strikes in Syria since they began in September, nearly 900 were members of Islamic State, according to the Syrian Observatory for Human Rights, a group that monitors the war. But the group still controls swathes of eastern and central Syria where it is battling to safeguard its "caliphate" rather than reform Syria, which is the aim of the rebels in the west. The Observatory says IS has recently cut the pay of its Syrian fighters. As in the past, IS has responded to the pressure by opening new fronts. Its fighters reportedly killed scores of government loyalists in an attack on state-held areas of Deir al-Zor city this week, one of Assad's few remaining outposts in the east. The groups fighting Assad in the west include FSA factions, Islamists with a Syrian nationalist agenda, and jihadists including the al Qaeda-linked Nusra Front that have been declared terrorists by the United States. The main non-jihadist groups are part of a newly formed opposition council backed by Saudi Arabia that is tasked with overseeing the hoped-for negotiations. The rebels say they will not negotiate until the other side shows good will by halting the bombardment of civilian areas, lifting blockades of population centers, and freeing detainees. The government meanwhile says it is ready to attend Jan. 25 talks in Geneva, though it wants to know which groups will be deemed terrorists as part of the process, another stumbling block given its view that all rebels fall into that category. Rebels interviewed by Reuters acknowledged recent government advances, but insist its manpower problems and dependence on foreign militias including Iranians still give the insurgents an important advantage and the capacity to fight back. The insurgency suffered a major blow on Dec. 25 when Zahran Alloush, one of the most prominent rebel leaders, was killed in an air strike near Damascus. The spokesman for one of the rebel groups fighting in northwestern Syria, the First Coastal Division, said the government side had captured Salma using overwhelming force. "Weapons do not concern it, and ammunition does not concern it, or the death of its troops, or anything else. 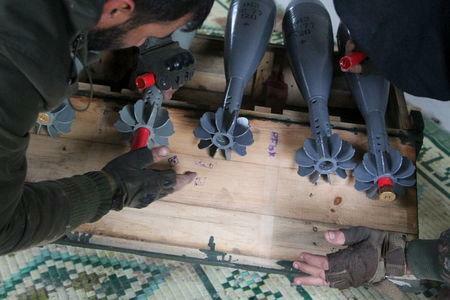 The only thing that concerns it is that they progress using all weapons, all planes," spokesman Fadi Ahmad told Reuters. A commander in the Ahrar al-Sham rebel group said the government and its allies were trying to advance toward the Turkish border. "They are trying to isolate the Syrians inside from the Turkish border. They are not as concerned about areas deeper in Syria, Hama and so on," he told Reuters. The government and its allies have also turned their focus to the south for the first time since Russia began its air strikes on Sept. 30, launching an attack on the town of Sheikh Maskin near the border with Jordan in late December. Rebels fighting under the umbrella of the Southern Front alliance - a major component of the newly formed opposition council - say the government attack that got underway in late December has been accompanied by Russian air strikes. Abu Ghiath al-Shami, the spokesman for one of the Southern Front insurgent groups, said that despite the onslaught the fighting was still "back and forth". "I promise you in the coming period you will see something different that will surprise everyone in terms of military action," he said. A Western diplomat said the government appeared intent on weakening the Southern Front before any negotiations. "I am surprised by the number of strikes and the number of forces from the regime side, including Hezbollah, and the Russian aerial bombing on behalf of the regime and the fact the town has still not fallen," the diplomat said.